No matter what Rose Hovick tried—hurling herself down flights of stairs, jabbing herself in the stomach, refusing food for days, sitting in scalding water—the baby, her second, would not go still inside her. A preternaturally stubborn little thing, which she should have taken as a sign. She wanted a boy, even though men did not last long in her house. Her first child, Ellen June, was a chubby brunette, twelve pounds at birth, tearing her mother on her way out. The house had no running water, and the attending midwife washed the baby clean with snow. A caul had covered her face, which meant Ellen June had a gift for seeing the future as clearly as the past. But she was clumsy, too, and by age three already diluting Rose’s dreams. Ellen June’s new sibling arrived early and when it was most inconvenient for Rose, during a trip to Vancouver, but the baby was instantly forgiven—even for being a girl. This second daughter had a sprig of bright yellow hair and blue eyes with dark circles etched beneath them, as if already weary, and her head seemed tiny enough to fit into a teacup. She could spin perfect circles on her toes before she could talk, and Rose decided that since the girl had refused be destroyed, she might consent to being created. Rose would give the baby everything—even things not rightfully hers to give—including her older daughter’s name, the first and favorite name. From then on the original Ellen June was called Rose Louise, Louise for short—a consolation prize of a name, half-borrowed from her mother. It was the first of many times she would become someone else. In the beginning the family lived in a bungalow on West Frontenac Street in Seattle, built of crooked wooden slats and a sloping shingled roof, squat as a bulldog, four rooms that felt like one, the kind of dank, dreary home that looked inviting only in a rainstorm. A porch jutted from the front, supported by columns where Rose could string wet laundry, had she been that kind of housewife. The place had a single grace note: the tiny square of Puget Sound visible from one window. No matter where Louise or Ellen June (nicknamed “June”) hid, their mother’s voice could find them. “Her low tones were musical,” June said, but “her fury was like the booming of a cannon.” Rose had married John “Jack” Hovick in 1910 at age18, one month pregnant with Louise, and by 1913, when her dainty baby June was born, she had already left and returned to her husband half a dozen times. She vowed to memorize his offenses, real or imagined, so that when the day came she could recite her lines in just one take. She wept for a moment at the horror of the memory. The courtroom quieted, waiting for her to compose herself. 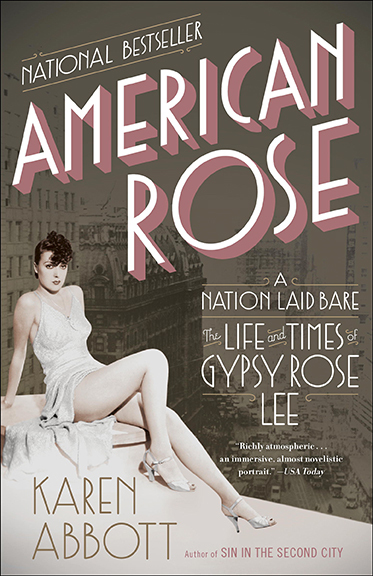 Her husband made $100 a month as an advertising agent for The Seattle Sun, yet refused, during all of their married life, to buy Rose even one hat or a dress suit or “any underwear to speak of.” He never gave her money to spend on herself or for “any purpose whatever”—including private dance lessons for Louise and June, although she omitted this last grievance from her public testimony. Rose wouldn’t use the girls to escape a life she’d never wanted, but instead to access one that had always stood just out of her reach. Rose understood compulsion and recognized its worth. Compulsion, along with indomitable women, had propelled her family through generations of misery, failure and boredom; it was by far their finest trait. She shared with her daughters a favorite bit of family lore. Their great-great-grandmother emigrated from Norway and set out for the West Coast in a covered wagon. She made it as far as the Sierra Nevada mountains when her party was stranded by a blizzard. Most of the party died, frozen or starved or devoured by wolves. Rescue workers whisked Grandma to the nearest settlement and undressed her, discovering what appeared to be horsemeat strapped around her body, hidden from the other survivors. She alone appeared plump and healthy. On closer inspection, the rescue team discovered it wasn’t horsemeat after all but rather the flesh of her less fortunate companions. It was a fairy tale, Hovick style, in which drama trumped veracity, and the women always won. On that afternoon in Professor Douglas’s studio, Rose’s eyes shifted from Louise to June. She watched June lift up until those tiny feet were perpendicular to the tile floor, and then her baby’s body let itself fall, legs parting into a split, seamless as opening scissors. Professor Douglas pulled at his beard. “What’s the matter with her now?” Rose asked. But Rose wouldn’t—couldn’t—wait, she told Jack that night. June was double-jointed; any child who could stand on her toes and do splits had to be. It was a gift, couldn’t he see that? “Frugal!” Rose yelled. “You’re Norwegian, that’s what you are. I should have listened to my mother. She tried to save me from throwing my life away.” The marriage was over, Rose declared. She would leave and take the girls with her. Jack Hovick told a different story. Instead of dance lessons he bought his daughters a kitten, and watched them pet the soft length of its belly as he left the next morning for work. When he came home, he found the pet’s body, the sweet little face severed from the torso and cotton fluff of its tail. A bloodied hatchet stood propped in a corner, mute testimony to what his wife had done, and what she might be inclined to do. He fled that evening and never returned.